On Wednesday, July 30, the fellows of Campaign for Youth Justice (CFYJ) held their second Summer Institute session featuring guest speaker Reverend Laura Downton, of the National Religious Campaign Against Torture (NRCAT). Rev. Downton is the current Director of U.S. Prisons Policy & Programs at NRCAT, and she also serves on the Board of Directors for Grassroots Leadership and is a Provisional Elder in the Baltimore-Washington Annual Conference of The United Methodist Church. The CFYJ fellows were joined by interns from the Justice Policy Institute, Washington Peace Center, and students from American University, Georgetown University, and University of North Carolina-Chapel Hill, who are current interns in Washington, DC. On July 1st, the Interfaith Criminal Justice Coalition held Lessons from the Field: Protecting Youth and Stopping the Cycle of Incarceration. The event focused on the importance of rehabilitation in the criminal justice system. The speaker was Father Greg Boyle, the founder of Homeboy Industries, an organization that provides wraparound services for former gang members.Homeboy Industries is the biggest program of its kind in the world. The Healing Justice Coalition invites faith communities, schools, and universities to unite in prayer, service and action to raise awareness of the realities of incarcerated youth, victims of crime, and families of both. This takes place at your place of worship or school. Juvenile Justice Month of Faith and Healing (JJMFH) is an opportunity for deeper insight and reflection through cross-over experiences. The Healing Justice Coalition invites faith leaders to visit incarcerated youth. We also provide speaker panels of formerly incarcerated youth and victims of crimes to visit your places of worship and schools. Together we can transform the paradigm of justice; moving from an over reliance on punishment, to focusing on healing the wounds caused by crime. Opportunities for Faith Communities:During JJMFH, The Healing Justice Coalition invites faith leaders to visit youth inside juvenile halls in Los Angeles County to manifest God's love for all children. This is typically a mutually transforming experience; moving and profoundly spiritual for the youth as well as the visiting faith leaders. Opportunities for Schools and Universities:Through the Healing Justice Coalition, formally incarcerated youth and victims of crime share their journeys with students. JJMFH is a rich opportunity for students to explore and reflect on the complexities of crime and punishment while moving towards a deeper understanding of restorative justice. Host a "Voices of Challenge" panel: A formerly incarcerated youth, parent of an incarcerated youth and a survivor/victim of crime share their stories. Invite a formerly incarcerated youth to share insight into the realities of incarceration and the strength of the human spirit. Lead a discussion or seminar in your congregation and/or school about the needs and situations of incarcerated youth and victims of crime. Faith Leaders can sign up for a group pastoral visit to juvenile hall. Offer prayers for everyone who has been impacted by crime; including victims, offenders, and families of both. Mobilize your congregation and/or school in support of legislation that promotes restorative justice principles. Twitter users are familiar with Worldwide Trends--popular hashtags of the moment. Fashion aficionados know what’s trending for each season. Trend analysis usually predicts what will happen in the future with consideration of the past. How do advocates, families, and youth make “youth justice” a trend? On October 10th, CFYJ will release State Trends Legislative Victories from 2011-2013 Removing Youth from the Adult Criminal Justice System which examines the accomplishments of states that enacted laws to keep kids out of the adult criminal justice system. The trend is towards more humane and appropriate treatment of kids in the criminal justice system, yet there is still much work to be done in order to have a justice system that recognizes that kids are different and deserve a chance at rehabilitation over severe sanctions. 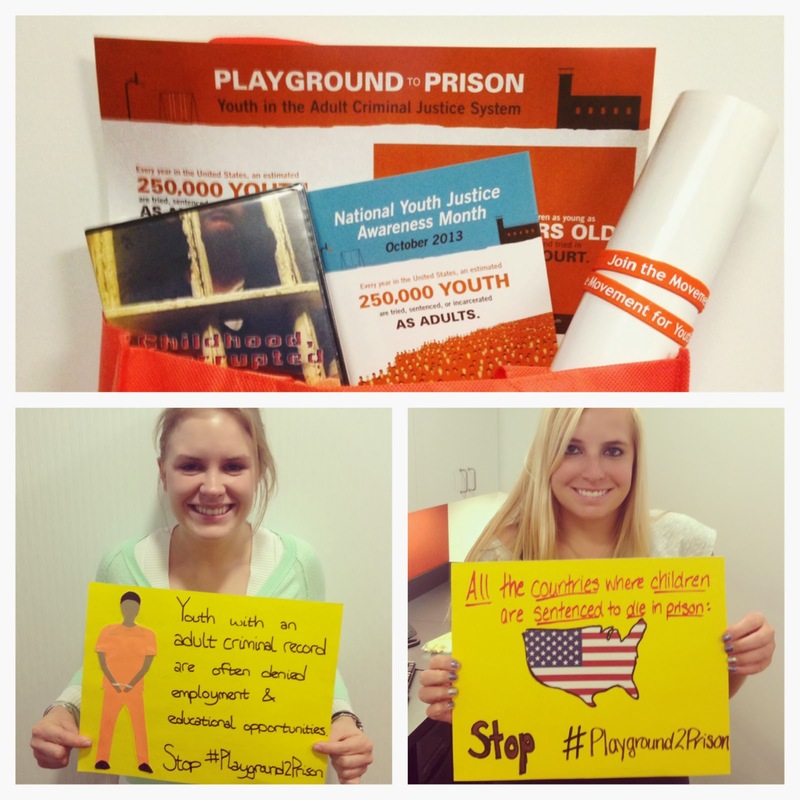 It’s Friday, which means one thing – it’s time to pick this week’s winner of the #Playground2Prison snapshot contest! Every week, during Youth Justice Awareness Month, the winner of the snapshot contest will receive a YJAM goody bag including great YJAM swag: a Childhood Interrupted DVD, YJAM bracelet, Playground to Prison infographic poster, and a YJAM tote. We received some great snapshots from this year’s first YJAM event at a happy hour fundraiser in DC. Guests posed with posters created by the Campaign for Youth Justice’s fellows and made signs indicating why they believe we need youth justice reform. This week’s winner is Marcus Bullock! We want to congratulate Marcus on his awesome snapshot demonstrating his support for ending #Playground2Prison and on receiving YJAM swag. During the second week of Youth Justice Awareness Month (YJAM) CFYJ will take a look back at the reform efforts that improve the lives of youth by decreasing the chances that they would come into contact with the adult criminal court. Here at CFYJ our mission is just that, and we partner with state organizations, advocates, youth and families to launch and win state legislative campaigns for youth justice. In the years at CFYJ, I have had the pleasure of working with many states to organize campaigns for juvenile justice reform to remove youth from adult court. The work has been tedious, exciting, rewarding and challenging. It is all worth it because we know from the research that youth in adult court are 34% more likely to recidivate at higher rates than those retained in the juvenile court. At the Campaign for Youth Justice we have worked diligently to create our campaign model to be successful in states where there is interest in building grassroots campaigns. We provide a myriad of technical assistance options to our partners such as, campaign planning, policy assistance, coalition building support, media assistance and training, hearing preparation, policy and political analysis. We know that the research supports our mission and we believe after 8 years of state based campaign work that the trends emerging are not by accident. On October 10th, we will be releasing our latest State Trends report which examines the states who have in the past several years changed state policies to remove youth from the adult court. Colorado is no stranger to these successes. In 1993, I was living in Colorado when the state expanded their laws to prosecute youth more harshly. It happened during a special legislative session to address a crime wave. This effort was led by then District Attorney Bill Ritter. Fifteen years later, in 2008 when the legislature passed a significant direct file reform bill, it was vetoed by Governor Ritter. It was tragic, but we were hopeful that with a new Governor coming into office we could do it again. In 2011, with families and youth, good data, media, an engaged coalition, and a skilled organizer we were ready to engage in a major campaign to end direct file. Building community support, strong spokespeople and legislative champions were all priorities. Our role in the campaign was to provide policy and media support as well as support the organizer of the Colorado campaign housed at the Colorado Juvenile Defender Coalition. There were two major pieces of legislation introduced, House Bill 1139, a jail removal bill and House Bill 1271, the direct file reform bill. HB 1139 was passed and signed into law in March 2012 helping to drive the energy needed to pass HB 1271. The bill was hotly contested and debated. On April 20, 2012 Governor Hickenlooper signed HB 1271 into law. Victory! Having been involved with this effort since 2009, I believe that the strong organizing effort with communities, youth and families, in addition to good data, incredible legislative champions and influential coalition members made this Colorado campaign a success. I was happy to have Colorado lead these efforts and I encourage other states to consider doing the same. If you are a state that is considering doing a reform campaign I urge you to contact us. We are happy to help!